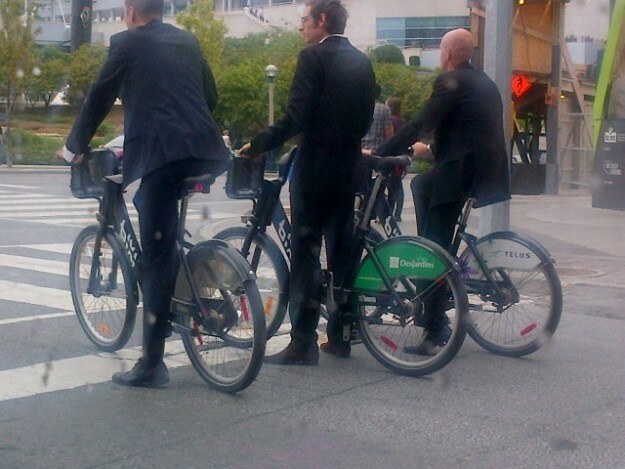 Love the suits on their Bixi rental bikes in Toronto. Forget the spandex and the fancy biking gear - it's all about getting around and getting things done. It's almost August people - enjoying your summer? The Primetime Emmy nominations were announced this week! Wanna here some of the best actor drama nominees talking about acting? It's over here. Smoochy Jon Hamm from Mad Men too. 17 nominations for that show alone. And I can't go a week with SOMETHING Sorkin or Newsroom-related. From the man who admits to writing "idealistically and romantically". Wanna hang with the arty crowd and sound smart? Four tips on how to talk about conceptual art. Need some inspiration to keep working at it? Sonny & Cher in 1965. They had a dream and they didn't give up. Love the band in suits and ties. Attract MORE visitors to your blog. Real strategies. For creatives. Dead guys in colourful suits. Inspiring. Do you read Apartamento? You should. In the meantime, read about the two guys who started it. What's up this weekend? We'll be hanging out with the grandparents and the girl will be playing with her cousins. Translated = lots of playgrounds and parks and skipping and swimming. And I suspect that I'll finish reading The Marriage Plot by Jeffrey Eugenides. Can't put it down!